. Published on February 14, 2016 . When the editors of Between Humanities and the Digital invited Katherine Hayles, one of the most prominent Digital Humanists working today, to provide an afterword for their volume, they must have been pleased that she accepted. That is, until they received the text of “Final Commentary: A Provocation” — a tidy, compact four-page dismissal of the volume’s preceding 500 pages. In it, she blasts the leading lights of DH for their conservatism, calling their contributions “revisionist rather than revolutionary” (503). Hayles argues that they fiddle while Rome burns, focusing on ways to reorganize academic departments or bring theory into digital methods when far more fundamental changes are afoot. The most fundamental of these, Hayles argues, is the shift in “human being” spurred by the synergistic interaction of human cognition with what she calls “the cognitive nonconscious” — ubiquitous technologies like RFID tags, GPS devices, and smart paint that are increasingly becoming taken-for-granted elements of our cognitive processes. “At present,” Hayles writes, “they so completely interpenetrate human systems that, were they suddenly to cease functioning, the result would be catastrophic loss of human lives and social chaos” (504). The mind technologically extended through interaction with the “cognitive nonconscious” demands a “revolutionary” shift in the way we conceive the humanities, Hayles argues. In an era when human consciousness plays out in and through the technological, we must alter our sense of what the “human” means in “humanities.” We need to shift our attention from how technologies affect our disciplines and institutions — as if technology were impacting them from the outside — and start again from the much more pressing question of how technologies affect what it means to be human. Hayles thus proposes a new guiding question for the humanities: “How are our engagements with technologies affecting human purposes?” (504). As useful as I would argue Hayles’s provocation is for the digital humanities and the humanities writ large, it is particularly useful for us today, in this session, at this conference. First, it underscores the importance of the extended mind thesis for humanities in the digital age. Second, it calls for something often lacking in the scientific and philosophical investigations of the extended mind; namely, a strong case for why it matters. Where many of these texts merely seek to show that the extended mind is real, or examine how it upsets earlier conceptions of the mind/body relationship, Hayles shifts attention to what it does — to the way that it “affects human purposes.” I want to argue that this presents a particular opportunity for scholars of modernism. This is because, as our panel is seeking to show, modernist writers and critics were very much aware of and preoccupied with the extended mind. And if they did not have particularly sophisticated ways of proving that it was real, they were ahead of their time in approaching it in terms of why it mattered. Hayles’s work has built an important bridge between the worlds of cognitive science and literary studies. In her 2012 book How We Think, she discusses the extended mind theory at length, drawing in particular on the work of Andy Clark. Hayles focuses on two of Clark’s books, Natural-Born Cyborgs (2003) and Supersizing the Mind (2008). Among the arguments of these books are the claims that, with the “gathering momentum of texts, PCs, coevolving software agents, and use-adaptive home and office devices […] the mind is just less and less in the head” (NBC 4). “We create these supporting environments,” Clark argues, “but they create us, too. We exist, as the thinking being we are, only thanks to a baffling dance of brains, bodies, and cultural and technological scaffolding” (NBC 11). “There is no self, if by self we mean some central cognitive essence that makes me who and what I am. In its place there is just the ‘soft self’: a rough-and-tumble, control-sharing coalition of processes — some neural, some bodily, some technological” (NBC 138). Most of us are nodding along. Modernists have been questioning the “hardness” of the unified self since at least Dr. Jekyll and Mr. Hyde and questioning the cognitive dominion of the conscious ego since Freud. This can make Clark’s books a bit of a slog for a scholar of modernism, since they are so determinedly focused on proving the extended mind theory and the multiplicity of the self, which we are already inclined to believe. This is frustrating because the sort of evidence Clark primarily relies on — thought experiments — don’t feel like enough like hard scientific proof, even to literary scholars. As Melba Cuddy-Keane has argued elsewhere, theorists of distributed cognition generally offer very little in the way of empirical validation, appealing rather to our capacity for belief. And so we naturally want to get on to the interesting stuff — the consequences. In Natural-Born Cyborgs, Clark says that the extended mind theory is important because the inert “scaffolding” of thought will increasingly “come to share the moral and psychological status of a part of our brains” (NBC 34), which, in turn, will have “implications for our science, moral, education, law, and social policy” (NBC 139). In the introduction to Supersizing the Mind, he says his book exists to argue that it “matters that we recognize the very large extent to which individual human thought and reason are not activities that occur solely in the brain or even solely within the organismic skin-bag” (SSM xxxviii; emphasis added). Clark clearly believes not only that thinking happens outside the skin-bag, as he calls it, but that knowing that it does — being aware of it — will and should affect the way we lead our lives. But neither book offers very much that is concrete as to how it will do so. In Natural-Born Cyborgs, Clark says that the extended mind theory should affect decisions about relocating Alzheimer’s patients (140). In Supersizing the Mind, he concentrates on its relevance within the disciplinary boundaries of “the sciences of the mind” (219). A modernist writer and critic who could have helped Clark to develop a compelling case for the more general consequences of the extended mind thesis is Marshall McLuhan. Indeed, the connection is so apparent that it’s somewhat astounding that McLuhan doesn’t appear in Clark’s bibliographies — a clear sign of the yawning gap that exists between cognitive science and literary studies. McLuhan’s major work, Understanding Media, is subtitled The Extensions of Man. Early in the book he writes, “Today, after more than a century of electric technology, we have extended our central nervous system itself in a global embrace” (19). Clark’s notion that “We create [our] supporting environments, but they create us, too” (NBC 11) is a slightly more modest restatement of McLuhan’s famous dictum, “the medium is the message” — the notion that, as McLuhan writes in the introduction to Understanding Media, “Any technology gradually creates a totally new human environment” — that “Environments are not passive wrappings but active processes” (viii). McLuhan is of course a far less careful or methodical thinker than Clark, and spends almost no time seeking to prove his thesis of neurological extension, jumping straight to motivations and consequences. But this is precisely what makes it so illuminating to re-read McLuhan with Clark and Hayles in mind. Understanding Media offers a dizzying array of theories as to why we have chosen to extend our minds technologically, what new social orders this promises, and what policy decisions this confronts us with. For McLuhan, the technological extensions of the mind herald, eventually, a unification of consciousness itself, when “the creative process of knowing will be collectively and corporately extended to the whole of human society” (19). But this process was being driven not by autonomous social or technological forces, but primarily by commercial interests. McLuhan speaks of “the extension of consciousness, so long sought by advertisers of products” and reflects dubiously on whether it will be “a good thing” (19). Most cynically, and perhaps most relevantly, McLuhan sees the extension of the mind into a privately-held technological network as akin to leasing our collective minds to a corporation. “Once we have surrendered our senses and nervous systems to the private manipulation of those who would try to benefit from taking a lease on our eyes and ears and nerves, we don’t really have any rights left,” McLuhan writes (73). That is why the extended mind thesis is so important for McLuhan — because it reframes issues of technological infrastructure as matters of human rights and collective public mental health. “As long as we adopt […] the attitude of regarding the extensions of our bodies as really out there and really independent of us,” he writes, “we will meet all technological challenges with the same sort of banana-skin pirouette and collapse” (73). McLuhan is already enjoying a renaissance among digital-age literary scholars and media theorists, and his works deserve further reconsideration in light of cognitive science and the extended mind thesis. Another modernist work in need of reevaluation is one that directly inspired McLuhan’s approach, Wyndham Lewis’s Time and Western Man. McLuhan first encountered Lewis’s work when he was studying at Cambridge in the 1930s under Richards and Leavis, a time when Lewis’s non-fiction was enjoying a vogue among undergraduates. 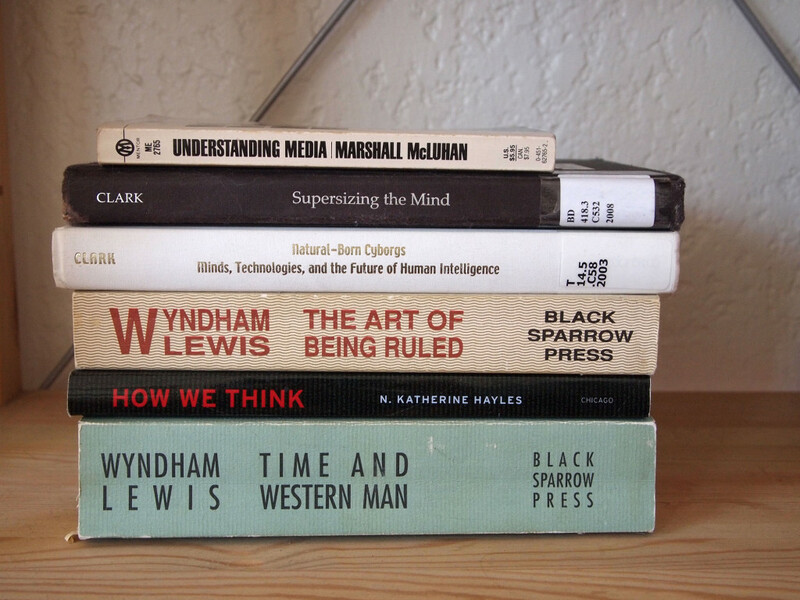 McLuhan claimed it was works like Time and Western Man and The Art of Being Ruled that “put [him] on to [the] study of the environment as […] a teaching machine” (“Wyndham Lewis Recalled”) and Lewis is one of the most frequently cited critics in McLuhan’s major works. Time and Western Man — a long, sprawling, somewhat rambling work of sociology, philosophy, and literary criticism, first published in 1927 — merits our attention largely because it foregrounds the question of why particular theories of mind arise at particular historical moments, and what role they play in re-shaping everyday life. The book’s basic idea is that abstract ideas matter — that seemingly abstruse notions like theories of space and time, and especially theories of mind, have tangible impacts on everyday life. Lewis’s account runs roughly as follows. He begins with industrialization, an economic process that powerfully associates progress with “revolution”: in the industrial age, progress becomes coterminous with the notion of continual improvement and constant overthrow of previous industrial processes. This notion of progress-as-revolution then spreads into other areas of life: Lewis writes that “the ‘progress’ of the engineer, the rapid changes and improvements of the technique of industry, make it natural for him to regard everything in terms of change and improvement, and to think that he can apply to himself or to other men the methods proper to machinery” (118). Lewis traces the revolutionary political ferment of the modernist period to the progress-as-revolution mindset instilled by industrialization. He in turn sees Freudian psychology as an attempt to map political revolution onto the mind: Freudian psychology is, he says, in a memorable passage, the result of the conscious ego “turning his bloodshot eye inward […] one fine day” and “beh[olding], with a start of horror and rage, his own proper mind sitting in state, lording it over the rest of his animal being” (343). He likewise discerns a political motivation in Bergson’s philosophical account of “creative evolution,” which makes the fundamental distributed cognition move of granting the status of mind to things outside the biological “skin-bag”: as Lewis summarizes Bergson’s philosophy, it places mind and matter on an equal plane, offering — “just to cheer us up” — “something alive, in place of ‘mechanism’: ‘organism’ in place of ‘matter’” (166). Lewis’s argument in Time and Western Man is that the host of ideologies derived from the industrial notion of progress-as-revolution do ordinary people no good. Lewis is totally unconcerned with whether they are true or not. (Indeed, for his part, he admits that the self is multiple and that thinking can happen outside the individual mind.) What matters to Lewis is who benefits from these ideas. As he sees it, the benefit is all on the side of those in power — in particular, those who control the media and the military. In The Art of Being Ruled, Lewis had argued in proto-McLuhanian fashion that the so-called “democratic citizen” of the early twentieth century functions as a mere “Robot manipulated by the press”; “at the pressing of a button,” he argues, “all these hallucinated automata, with their technician-trained minds and bodies, can be released against one another” (106). The villain of Time and Western Man is not a politician or a media baron but a philosopher of mind: a behaviourist who eliminates the notion of “mind” and redefines the person as a “reaction mass” (320). “The behvaiourist,” Lewis writes, is “the bravo sent by positivist science over to psychology to make an end of consciousness once and for all” (326); the behvaiourist’s motto, for Lewis, is that “the military organization of the vast masses of people militarized during the War must be carried over into ‘civil life’” (322). In Lewis’s account, theories of mind like those promoted in popularizations of Freud and Bergson lay the ideological groundwork for the behaviourist, emphasizing the unconscious and minimizing conscious, willed action. Lewis in turn argues that what is needed in the face of the behaviourist threat is a counter-ideology that emphasizes the active, independent, critical consciousness. “Our only terra firma in a boiling and shifting world is, after all, our ‘self,’” he writes: “That must cohere for us to be capable at all of behaving in any way but as a mirror-image of alien realities” (132). Some of his suggestions for this campaign are somewhat facetious. “I believe,” he writes at one point, that people “could with advantage be compelled to remain absolutely alone for several hours every day; and a week’s solitary confinement, under pleasant conditions (say in mountain scenery), every two months, would be an excellent provision. That and other coercive measures of a similar kind, I think, would make them much better people” (118). But his main suggestion is that artistic creation and criticism — acts that, in a Coleridgian spirit, he associates with divine creation — would reinforce the sense of willed agency and act as counter-measure against the invaders of the mind. In our own moment, Lewis’s approach is helpful in shifting the question from whether the extended mind thesis is accurate to why it is being proposed with such vigor at this particular historical moment, and what its social consequences will be. In How We Think, Hayles pauses on the “uncanny resemblance” — noticed by theorists such as Catherine Malabou and Alan Liu — between contemporary theories of mind and contemporary global capitalism, both of which emphasize networks over individual actors and plasticity over fixed roles. Malabou’s question — “What should we do so that consciousness of the brain does not purely and simply coincide with the spirit of capitalism?” (12) — serves as an important contemporary echo of Lewis’s in Time and Western Man. Theories of mind have tangible effects in the real world, and so they must be understood in their context, and consciously molded so as to intervene in — and not merely to reflect — this context. The question is not only whether a theory of mind is true, but also how it affects human purposes. Clark, Andy. Natural-Born Cyborgs: Minds, Technologies, and the Future of Human Intelligence. Oxford: Oxford UP, 2003. –––. Supersizing the Mind: Embodiment, Action, and Cognitive Extension. Oxford: Oxford UP, 2008. Cuddy-Keane, Melba. “Distributed Cognition as Qualia: Insights from Modernist Narrative.” Discussion paper. History of Distributed Cognition workshop, Edinburgh, July 2015. Hayles, Katherine N. “Final Commentary: A Provocation.” Between Humanities and the Digital. Eds. Patrick Svensson and David Theo Goldberg. Cambridge: MIT Press, 2015. 503-507. –––. How We Think: Digital Media and Contemporary Technogensis. Chicago: U of Chicago P, 2012. Lewis, Wyndham. The Art of Being Ruled. 1926. Ed. Reed Way Dasenbrock. Santa Rosa: Black Sparrow, 1989. –––. Time and Western Man. 1927. Ed. Paul Edwards. Santa Rosa: Black Sparrow, 1993. Malabou, Catherine. What Should We Do With Our Brain? Trans. Sebastian Rand. New York: Fordham University Press, 2009. McLuhan, Marshall. Understanding Media: The Extensions of Man. Second edition. New York: Mentor, 1964. –––. “Wyndham Lewis Recalled.” artscanada. The Society for Art Publications. 1967. LP.